Whispers in the Loggia: To the Young, and Well Beyond, "Love Doesn't Happen Because We Talk About It, But When We Live It"
To the Young, and Well Beyond, "Love Doesn't Happen Because We Talk About It, But When We Live It"
As the Amoris Wars rage on – with nary a glimmer of light nor witness to show for all the mountains of clickbait – this weekend saw one of the Vatican’s largest events of this 13-month Holy Year: a Jubilee pilgrimage for teenagers, which drew over 100,000 young people to Rome as the Pope pitched in to hear their Confessions yesterday in the Square (above) and the city’s Olympic Stadium hosted a prayer rally and concert. 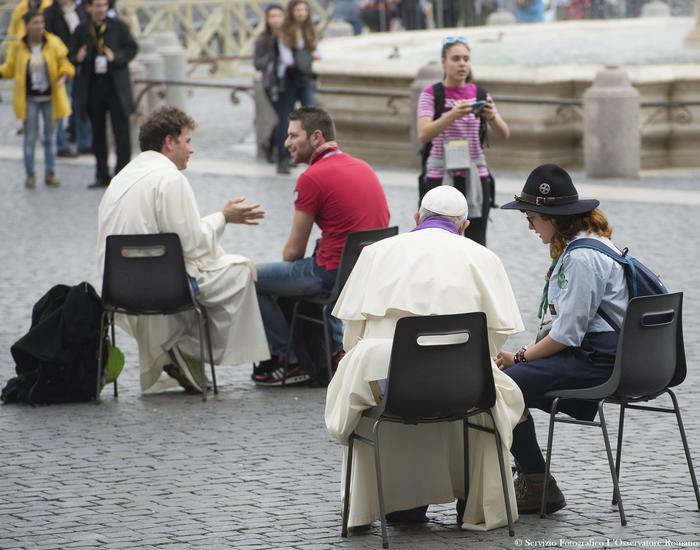 Closing out the gathering this morning with the Jubilee’s biggest outdoor liturgy to date, Francis’ homily was more a life’s lesson from the high-school teacher he once was than any kind of high-church exegesis. If anything, though, it fits the moment – as recent days have shown how at least some of the ecclesial conversation needs to re-engage the faith at a far simpler level than magisterial documents, this message’s most important audience might just be a bit different than its intended one…. Dear young friends, what an enormous responsibility the Lord gives us today! He tells us that the world will recognize the disciples of Jesus by the way they love one another. Love, in other words, is the Christian’s identity card, the only valid “document” identifying us as Christians. It is the only valid document. If this card expires and is not constantly renewed, we stop being witnesses of the Master. So I ask you: Do you wish to say yes to Jesus’ invitation to be his disciples? Do you wish to be his faithful friends? The true friends of Jesus stand out essentially by their genuine love; not some “pie in the sky” love; no, it is a genuine love that shines forth in their way of life. Love is always shown in real actions. Those who are not real and genuine and who speak of love are like characters is a soap opera, some fake love story. Do you want to experience his love? Do you want this love: yes or no? Let us learn from him, for his words are a school of life, a school where we learn to love. This is a task which we must engage in every day: to learn how to love. That is because love is a free gift which calls for an open heart; love is a responsibility, but a noble responsibility which is life-long; it is a daily task for those who can achieve great dreams! Woe to your people who do not know how to dream, who do not dare to dream! If a person of your age is not able to dream, if they have already gone into retirement… this is not good.Love is nurtured by trust, respect and forgiveness. Love does not happen because we talk about it, but when we live it: it is not a sweet poem to study and memorize, but is a life choice to put into practice! How can we grow in love? The secret, once again, is the Lord: Jesus gives us himself in the Mass, he offers us forgives and peace in Confession. There we learn to receive his love, to make it ours and to give it to the world. And when loving seems hard, when it is difficult to say no to something wrong, look up at Jesus on the cross, embrace the cross and don’t ever let go of his hand. He will point you ever higher, and pick you up whenever you fall. Throughout life we will fall many times, because we are sinners, we are weak. But there is always the hand of God who picks us up, who raises us up. Jesus wants us to be up on our feet! Think of the beautiful word Jesus said to the paralytic: “Arise!”. God has created us to be on our feet. There is a lovely song that mountain climbers sing as they climb. It goes like this: “In climbing, the important thing is not to not fall, but to not remain fallen!. To have the courage to pick oneself up, to allow oneself to be raised up by Jesus. And his hand is often given through the hand of a friend, through the hand of one’s parents, through the hand of those who accompany us throughout life. Jesus himself is present in them. So arise! God wants us up on our feet, ever on our feet!